The Wolverhampton Cross, St Peter’s Church, Wolverhampton. Information board near the cross, St Peter’s Church, Wolverhampton. OS Grid Reference: SO 91406 98769. 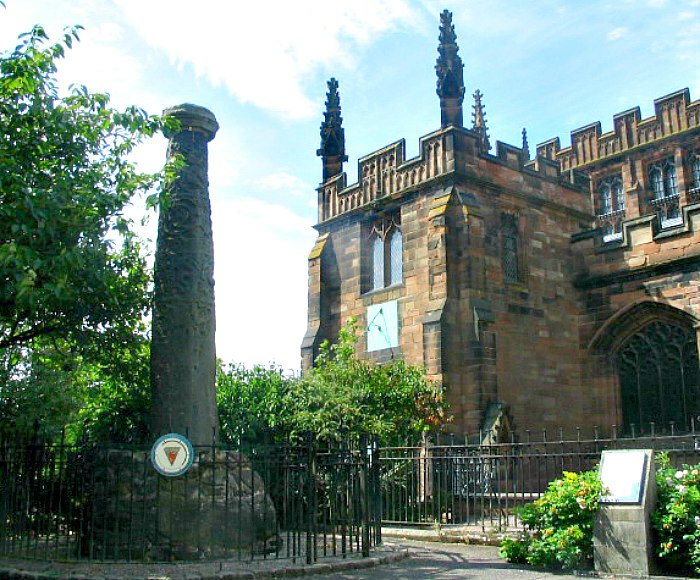 Near the south door of St Peter’s Parish Church, Wolverhampton, West Midlands, stands a 4m high blackened column which is called ‘The Wolverhampton Cross’, St Peter’s Garden Cross, or sometimes Saint Wulfruna’s Cross. This curious column may, in fact, have come from the Roman town of Wroxeter, but in the mid-9th century AD Saxon stone-masons added carvings to it and, from that time on, it became a preaching cross that ‘may’ have been associated with a Saxon monastery on the site, though there seems to be little evidence for that. A small, slender stone cross used to be affixed to the top of the column’s capital. The decorative Anglo-Saxon carvings on this cylindrical shaped monument are now very faint and indecipherable, but in certain light and shade they tend to be more visible. At the north-side of the church is a modern statue of Wulfruna, a 10th century Mercian saint. St Peter’s Collegiate Church stands between the Council Offices and Wolverhampton Gallery on Wulfruna Street and St Peter’s Walk, at the north-side of central Wolverhampton, opposite the University and Arena Theatre buildings. The Wolverhampton Cross stands beside St Peter’s parish church. 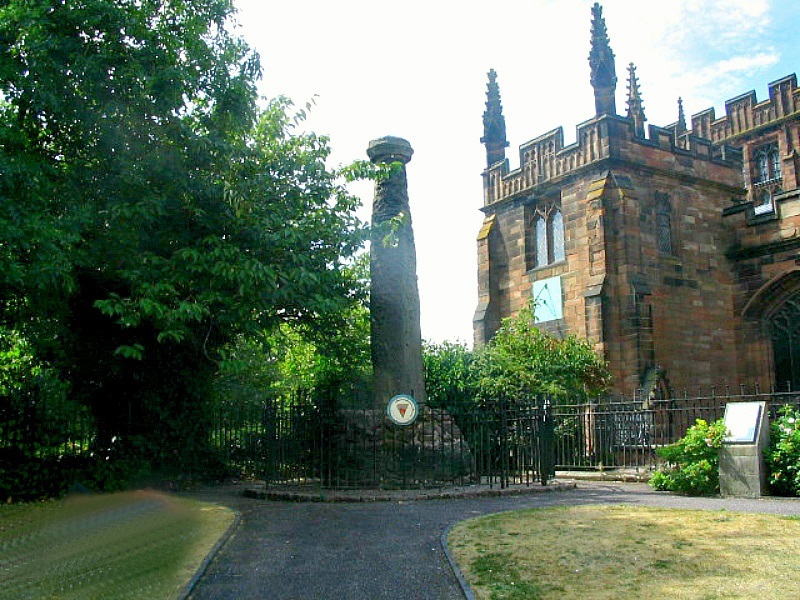 The Wolverhampton Cross, Wroxeter Roman column, St Peter’s Garden Cross or, even Saint Wulfruna’s Cross, call it what you will, is a column/pillar made of sandstone that stands just over 4 metres (13½ feet) high on its large sturdy base of four rounded steps. It cylinder-shaped shaft gradually tapers away towards the top to be surmounted by a capital where originally a cross was built onto it – and what a spectacular monument it must have been. Thought to date from 850 AD although historians now tend to think that it was carved in the late 10th century at which time (994 AD) a monastery was founded here by St Wulfruna and the original church perhaps raised to ‘minster status’, although scholars think it unlikely that there ever was a Saxon monastery. The present church is 15th century. If the column did originally come from Roman Wroxeter (Viraconium), could it have been stolen by Saxon stone carvers? – so to speak, and then brought to Wolverhampton! There are carvings on the column, although faint, of foliage, acanthus leaves, scrolls, beasts, birds and other ornament, but you’ll need to look very closely and have the right light and shade. Kendrick (1938) “considered the decoration to be unique; the only surviving example in England which demonstrated the southern continental Baroque style.. He also thought (1949) that it illustrated “a taste for a crowded display of finicky decoration”, which is also reflected in the later Stapleford Cross,” according to the Wikipedia website. Robert Harbison (1993) tells of St Peter’s Church “St Peter’s chancel is long and prominent, made that way in the 1860s by Ewan Christian to balance the 16c tower. Old photos reveal that the E end is all Victorian. Here they were right, because the 17c chancel was undeniably mean. Inside, however, we deduce the addition was planned for external effect, because from within it feels much too long. “The nave is an awesome space, towering up to the gloom of a good roof. In the N aisle interesting Whallish windows of local provenance. On the Perp stone pulpit there’s a wonderful lion guarding the stair. St Peter’s parish Church with modern statue of St Wulfruna. As to St Wulfruna, mentioned earlier, not that much is known, though she seems to have been purely a local saint; and a noblewoman of the royal house of Mercia. She was the wife of Earl Athelme, mother of St Wulfric of Burton, and granddaughter of King Aethelred I. King Edgar was related to her. Legend tells that in 948 Wulfruna was kidnapped and imprisoned at Tam-worth by the Viking chieftain, Olaf, but she did manage to escape! 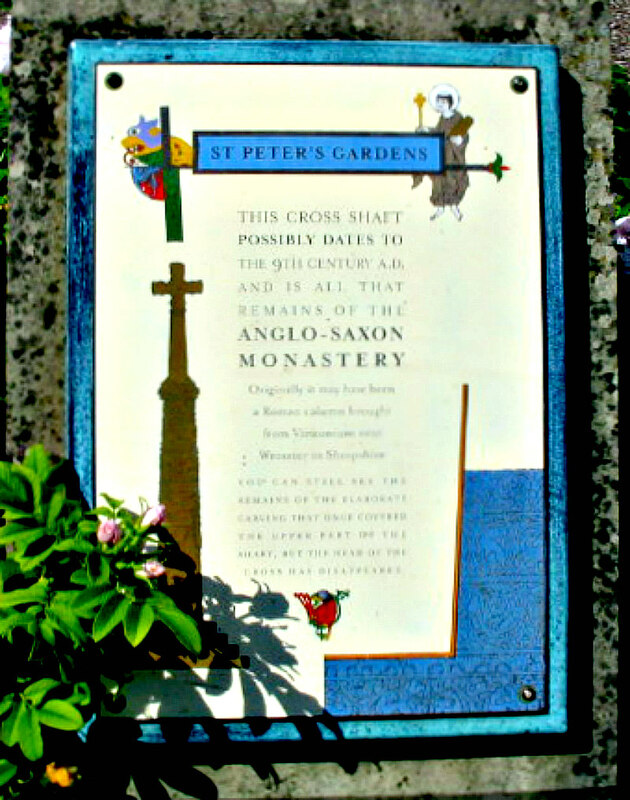 Some have suggested that she founded a convent at or near the present St Peter’s Church (at the place called Hēatūn, later known as Wolverhampton), but this might not be the case. It would seem she was granted some land at Pelsall (Peoleshale) in 985. St Wulfruna died and was buried at Tamworth in 996 or 1005. There is a holy well named after her in Goresbrook Road, Wolverhampton (see link below). 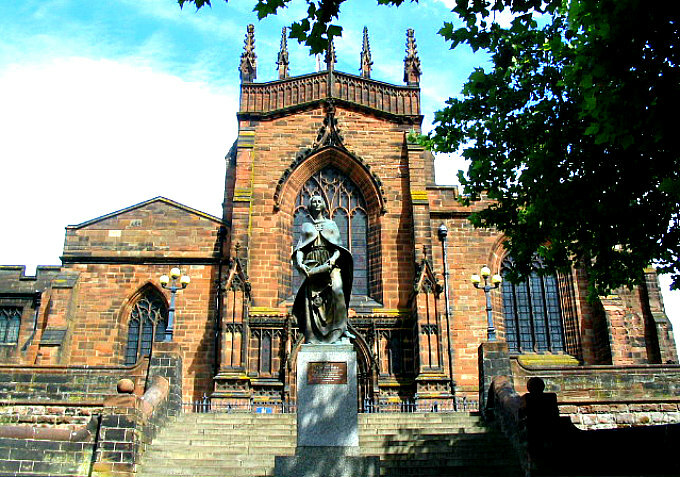 A modern statue of Lady Wulfruna by Wheeler stands in the square at the north-side of St Peter’s church. Kendrick T. D., Anglo Saxon Art to AD 900, p 192-3, 1938. Kendrick T. D., Late Saxon and Viking Art, p 71-2 (plate XLVI), 1949. Categories: Ancient Crosses | Tags: The Wolverhampton Cross at St Peter's Church in Wolverhampton in West Midlands | Permalink.